Dining Out: The Breakfast Club | Pop.Bop.Shop. Remember when it snowed on Sunday? (Sorry to bring up that painful memory). 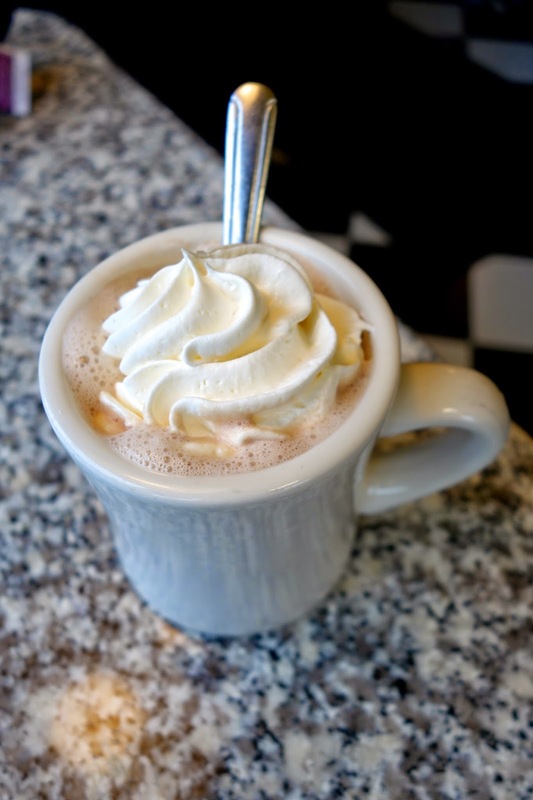 Instead of hibernating inside beneath a fleece blanket, I headed out to Allston's The Breakfast Club, a place I had been wanting to try since last December when a friend shared an Instagram photo of their peppermint hot chocolate, which was garnished with a candy cane. What can I say? I'm a sucker for packaging. My friend and I arrived at 1:00pm and there was still a line out the door. The brunch rush at The Breakfast Club is crazy! 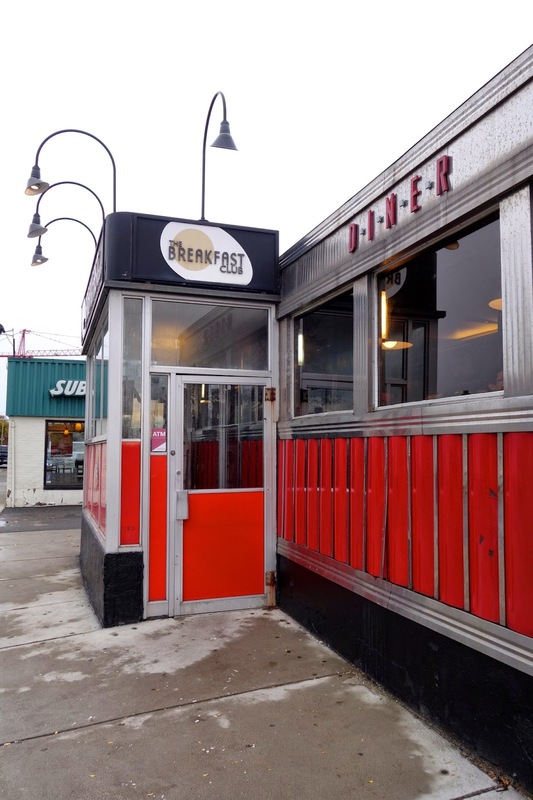 Inside, the restaurant pays homage to the classic diners and soda shops of the 1950s with leather booths and black and white checkered floors. 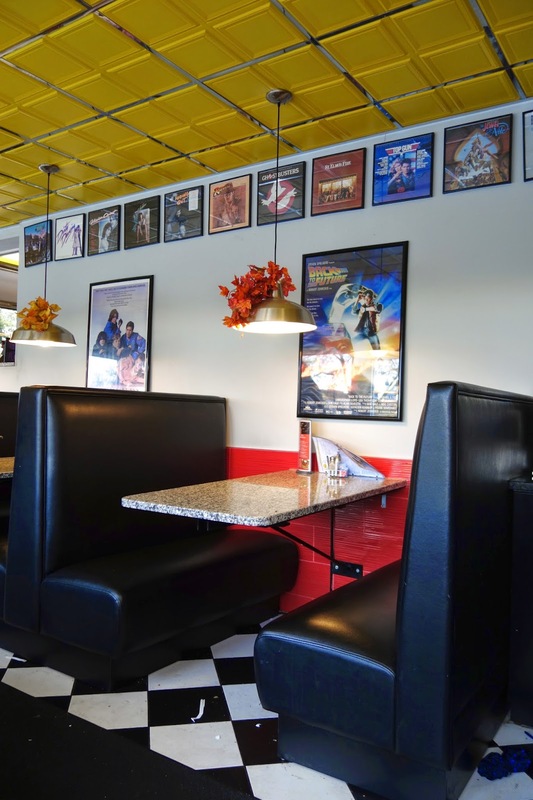 The classic diner vibe is complimented with 1980s throwback movie posters and memorabilia. We were seated across from the posters from "The Breakfast Club" (how appropriate) and "Back to the Future." Ahhhh, Michael J. Fox. 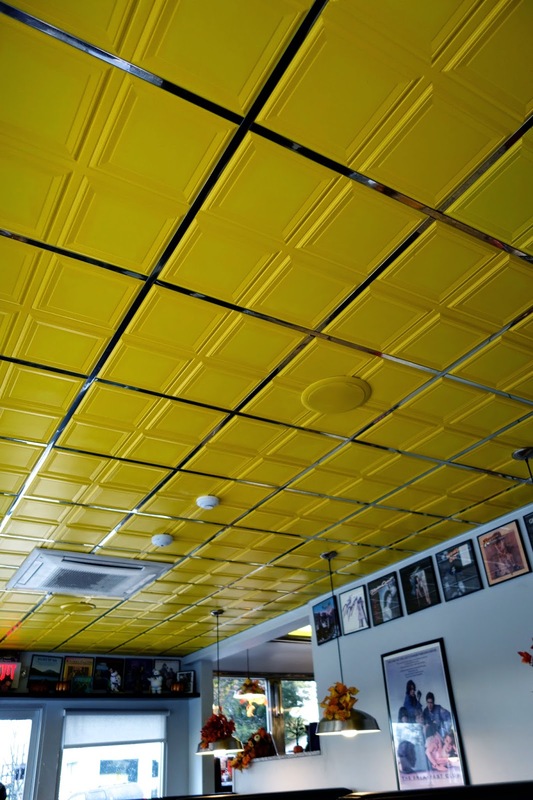 Of all the decor elements, my favorite part was the bright yellow ceiling. It matches the egg yolk in the restaurant's logo. As soon as we were seated we began to drool over all the menu options. We were cracking up over the names of the Library Specials, things like "The Dork" or "The Basket Case" or "The Detention." Since it was absolutely freezing outside, we each started with a hot drink. My brunch date ordered a cup of tea and they brought her a full pot. Since I don't drink coffee and I'm pretty picky about tea, I opted for hot chocolate. The waitress asked, "Would you like that with whipped cream?" Ummm. Of course I would. Look at that perfect swirl! We had been invited to the restaurant to sample the new fall specials menu, so the owner, George, began to send the specials out one by one. The first plate to arrive was the pumpkin coffee cake French toast. Yes, people, that is pumpkin coffee cake that is then used to make French toast. This dish was super rich and between us we could only finish one piece! Next up, the pumpkin pecan pancakes. 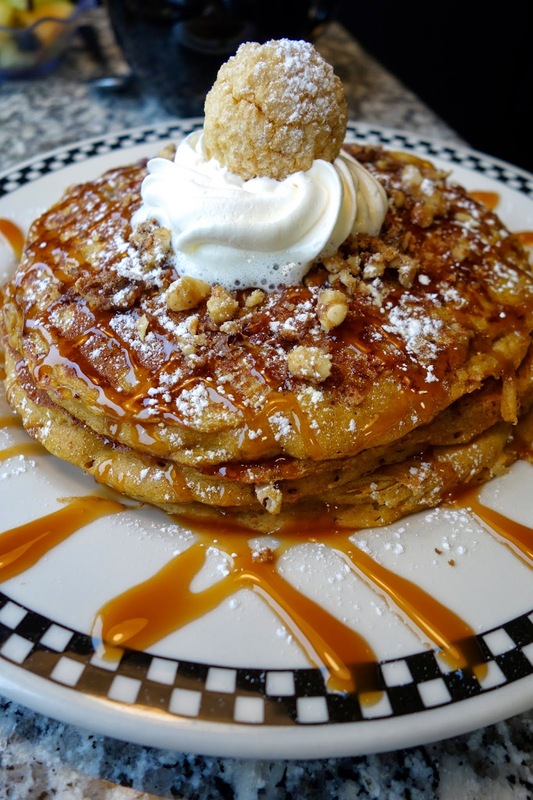 This is The Breakfast Club's classic buttermilk pancake recipe flavored with fresh pumpkin, cinnamon, nutmeg and brown sugar, then topped with chopped glazed pecans, crushed Italian amaretti cookies, a dollop of whipped cream and a drizzle of caramel. I took one bite of the pancake and announced, "This is what fall should taste like." The pancakes were so light and fluffy and that amaretti cookie on the top was amazing. It was a drunken cookie! On the fall specials menu there is also an omelette which comes stuffed with caramelized sweet potato, onion and cheddar cheese. It comes with a side of fruit salad which is topped with one very beautiful piece of star fruit. If you like sweet potato, this omelette is a great choice. Now, though we were focused on the fall specials, we felt that in the name of research, we should also order some regular menu items. We requested the florentine eggs benedict, which is traditional eggs benedict, but the bacon is replaced by spinach and tomato. I've had a lot of vegetarian eggs benedict and this rendition was truly excellent. It had the right amount of Hollandaise sauce, very fresh spinach and tomato slices and a delicious English muffin. At the recommendation of George, the owner, we also requested the Nutella French toast. It came topped with a boat load of fresh strawberries and bananas. This dish was food nirvana. I would trek to The Breakfast Club in any weather to eat this again. Overall, our experience at The Breakfast Club was a fantastic one. The food, especially the pumpkin-filled fall specials, is crazy yummy and dangerously craveable. Food aside, the best part of the experience was getting to know George, the restaurant owner. He has run The Breakfast Club for over 14 years and has really come to know his customers. He shared with us that he and his team used to do daily menu specials and then they shifted to weekly specials, but loyal customers would complain that a favorite dish would come and go too quickly so now they are focusing on seasonal specials. The fall list will last through December 21st, when the winter specials will take over. If you haven't been to The Breakfast Club, you simply must try it. They are located at 270 Western Ave. and they have their own parking lot (victory!). Don't even bother changing out of your pajamas, because you'll be in a serious food coma and need to lie down immediately afterward. Have you been to The Breakfast Club? What's your favorite dish? Um, I need to go to there. i LOVE this place. spot on. 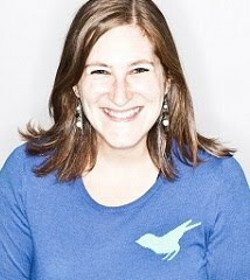 You may remember that last fall I made my very first trip to The Breakfast Club in Allston. It's pretty hard to forget those photos of pumpkin coffee cake French toast, pumpkin pecan pancakes and that strawberry Nutella dessert. If you need a refresher, click here. Visit Spring Shabu-Shabu to enjoy Japanese-style hot pot cooking. Select all your own meats, noodles and vegetables and send them for a swim in one of five broth choices. Two weeks ago I was driving on Western Ave. in Allston when I noticed something new had popped up! I squinted and saw the sign read, Stone Hearth Pizza. 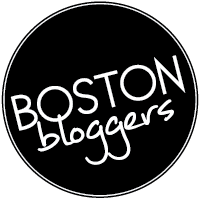 I knew I had read about about Stone Hearth somewhere and after a little poking around online I found the original source, a friend's blog: Free Food Boston!